It’s no secret that a beautiful and well-manicured lawn can provide massive amounts of curb appeal to a home. 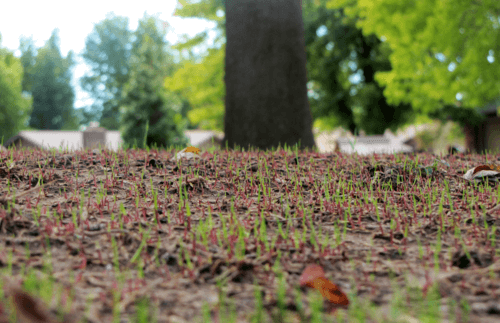 One thing that may surprise you is how easy it can be to develop a healthy and thriving turfgrass system by avoiding some of these common mistakes. Cutting your grass really short may seem like an efficiency, but it can actually cause more harm than good. Also known as “scalping,” grass blades that are cut too short will have a reduced ability to absorb sunshine and water, making your lawn more prone to growing weeds. Our rule of thumb: Don’t cut more than ⅓ of the blade at a time. For long-term root health, don’t water your lawn every day. Watering less frequently but more thoroughly will give you the best results. In addition, avoid watering during the middle of the day; early morning is the optimal watering time as it will allow the water to seep into the soil. Test your soil to learn what it needs to be healthy. Whether you test it yourself or send it to an extension service, it’s an important step for a healthy lawn. Generally, healthy soil for turfgrass has a pH of 6.0 to 7.0. Good soil is a key ingredient to a healthy lawn. Fertilizer is an excellent soil supplement, providing essential nutrients the soil may be lacking in its original state. We offer a variety of types and work with our customers to find the best solutions for them. Keep in mind that you’ll get the best results by applying the correct amount of fertilizer during the right time of the year. Read more on our FAQs page, or contact us to learn how to properly fertilize your lawn. Get the best results by mowing your grass when it’s dry. If you cut wet grass, you risk leaving your lawn looking patchy and damaged. The grass will also clump, stain carpets and clothing and be increasingly susceptible to disease. Start off each season by sharpening dull lawn mower blades. Not doing so will result in an unclean cut, making the grass look unhealthy. It also leaves the grass more prone to disease, nutrient deficiency and decreases water absorption. 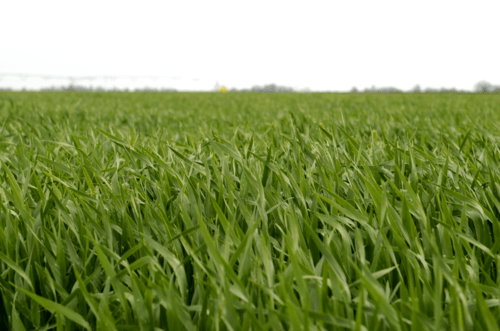 Remember to evaluate the region you live in when choosing a type of grass for your lawn. Does your yard get a lot of shade? Is your region exposed to droughts? Does your region have extreme temperatures? These are all important considerations to ensure success. Seeding your lawn during the right time of the year will set you up for long-term success. For cool-season grasses (like fescue and ryegrass), it’s best to seed during late summer and early fall, while warm-season grasses (like bermudagrass and buffalograss) flourish when seeded during late spring and early summer. Preparation is key to a healthy, beautiful lawn. Before seeding your lawn, be sure to complete a soil test; remove all weeds, rocks and other debris; check the moisture of the soil – it should crumble in your hands; break up the soil with a rake; and add compost. Whether you’re a do-it-yourselfer or prefer to hire the professionals for lawn maintenance, it’s important to develop a seasonal lawn maintenance schedule and adhere to it fully. While this schedule will differ depending on your climate and type of grass, here is an easy-to-follow guide for common lawn maintenance tasks and applications by season. Looking for more lawn tips? Get in touch with one of our experts, who will be happy to help you get on your way to a lush, green lawn.